Less than half the size of comparable gunsmithing screwdriver sets! 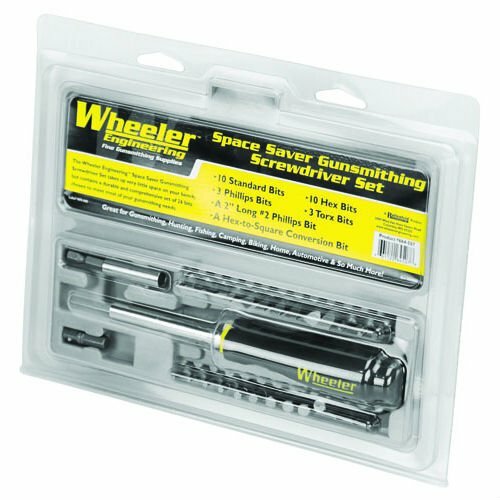 The Wheeler® Space Saver Gunsmithing Screwdriver Set takes up very little space on your bench, but contains a durable and comprehensive set of 26 bits chosen to meet most of your gunsmithing needs. It's also the perfect size to include on your trips to the range and the field. Included with the standard, Phillips, hex, and torx bits, is a 2" long #2 Phillips bit which is ideal for recoil pad installation, and a hex-to-square conversion bit which allows you to use 1/4" square drive sockets and other attachments. 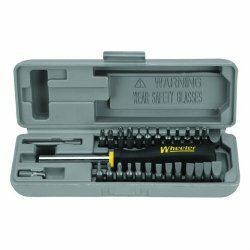 The magnetic handle is perfectly sized for gunsmithing needs, and is also hollow-handled, allowing you to carry a variety of bits should the need arise.